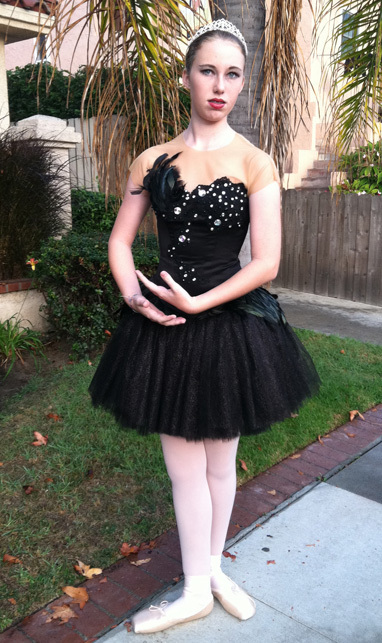 This year she decided to be a Black Swan. We had seen this pattern from Simplicity That she fell in love with. 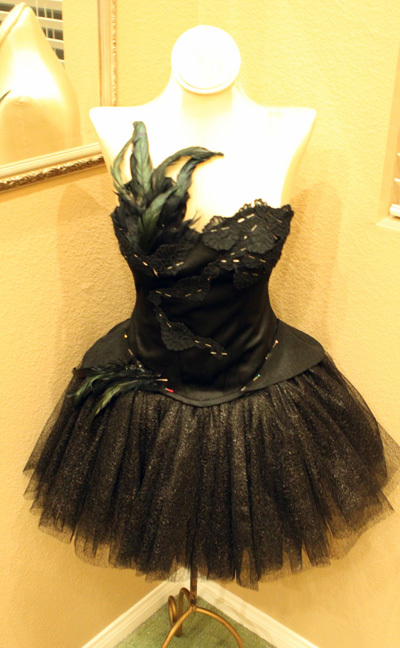 So doing what I do-and researching the costume I started creating her Black Swan. I guess it was a pretty popular costume because I found so many interesting blogs and images of it. I found tutorials on making the crown (unfortunately we didn’t have time to make one) tutorials on makeup, and images from the movie. 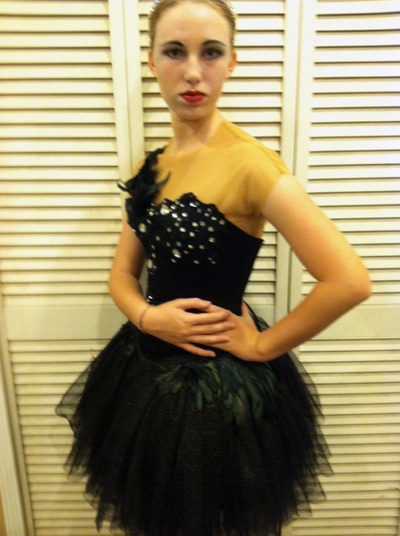 I started with the pattern and the basic corset. I wasn’t sure if I was going to follow the pattern with trim ideas or go more for the actual costume design from the movie. 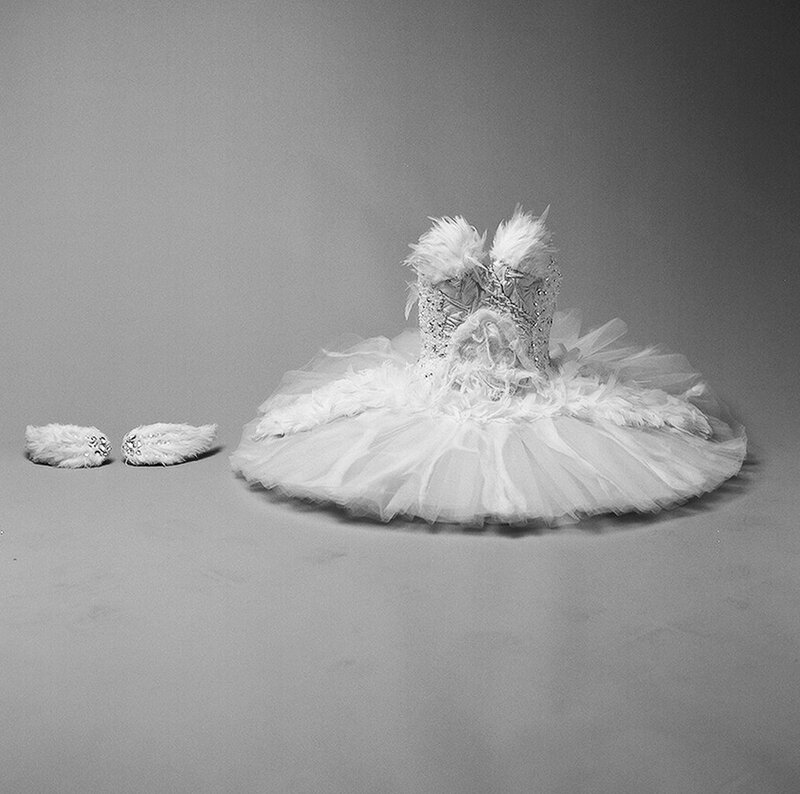 I loved the White Swan costume too. I pinned different trims on the corset to see what she would like- since it is her costume she needed to have some say in the design. Here is the trim like the pattern. We had found a really pretty black with silver thread vine like trim with roses and sequins. 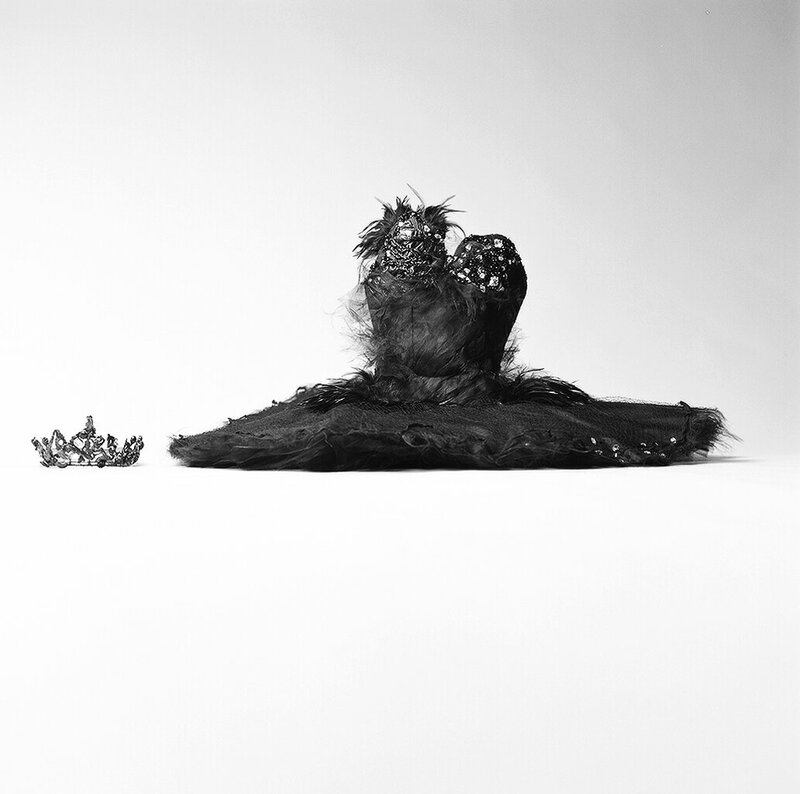 A feather boa adorns the top. Sorry for the poor quality pics. I had taken them really quick with my iPhone. The lighting is horrible in my hallway too- plus it doesn’t help that my walls are tan. 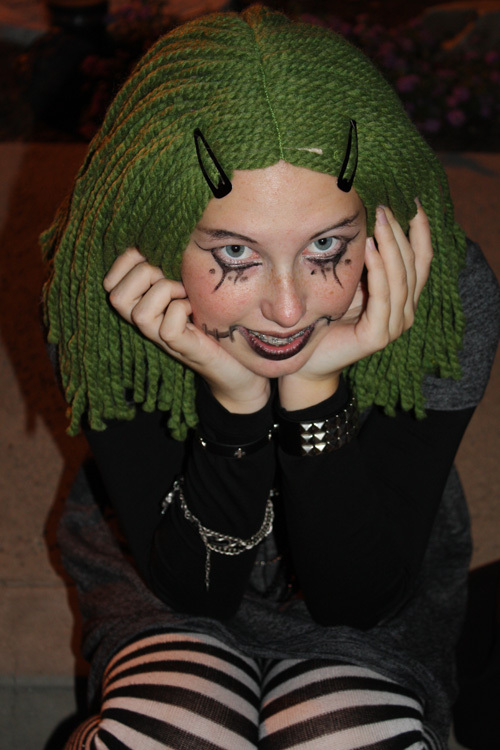 I wasn’t completely happy with this look- although Maddie (my daughter) liked it. I felt we needed something a little more sleek in a way. Well, let me get the skirt done and try something else. Ok so that was a job. 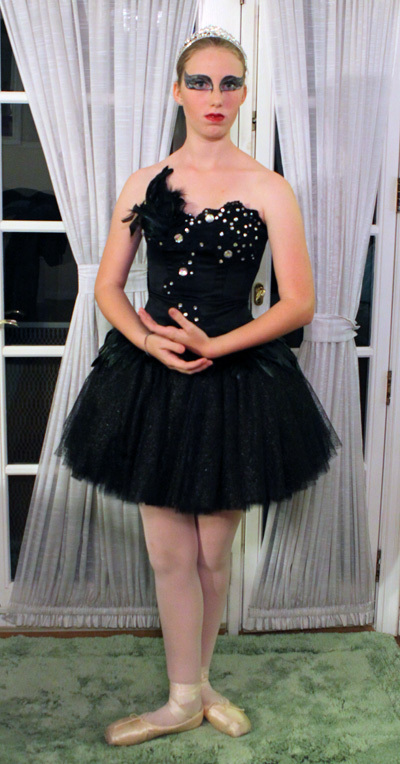 The tulle skirt was quite a challenge and working with tulle is NOT the easiest thing in the world to do. I had added an extra layer too, to make it a little fuller, but had eliminated the boning through the bottom of the lining as the pattern called for. Maddie and I didn’t like the look the boning had gave it. We also decided on the feather bust, and I had some very pretty Alencon lace trim from a previous project that I was able to cut and use as applique on the bust. The pic above has the lace trim pinned as well as the felt panels pinned on that I will apply the feathers to later. 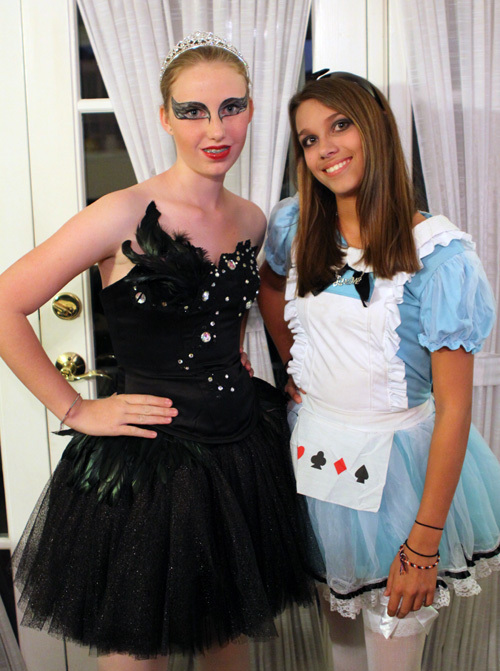 So we both preferred this look that is more like the movie costume. 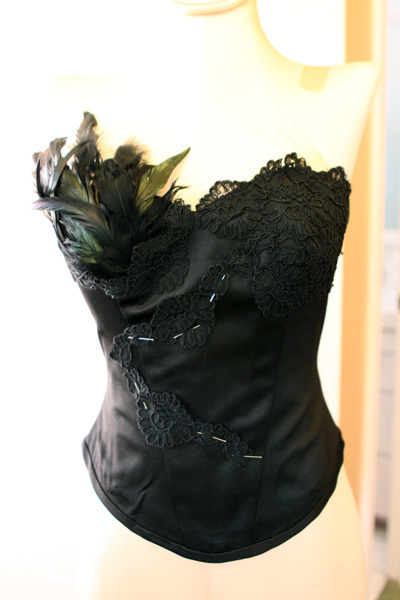 I hand sewed all the lace on as well as the feather panel. 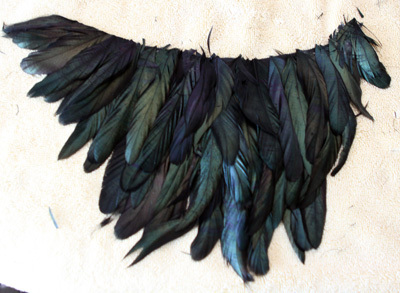 Now to make the feather sides. I wanted it to be like wings folded close in the shape of it. We had found a feather wreath at Joann’s that happened to have the perfect feathers to use. You just can’t find the right feathers in the craft areas and feather trim was just way too expensive- plus we were short on time and didn’t have time to order online. Wreath was 50% off along with a 15% off coupon- I think it cost less than $17 for more feathers than I needed. I probably couldn’t have got the trim or the bags of feathers I needed for that amount. Maddie stripped the feathers off the wreath form and I started gluing them onto the felt bases. Starting at the bottom I glued one row trimming the top of the feather off. Then I let it dry. I didn’t take pics as I was working on it- wish I would have. After it was dry I did a second row and so on – I think I ended with 3 or 4 rows. 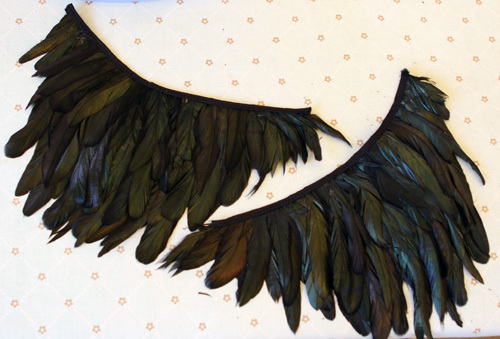 When they were completely dry, I took some black bias tape and sewed it along the top to cover the raw edges of the top layer of feathers. After it was completed I had two feather side panels- one right and one left. So here she is modeling it with sample makeup to make sure everything is right. We had gone to a dance shop and were able to get a pair of pointe shoes on sale, purchased pink tights and trunks as well. I needed to make a flesh colored under shirt so she could wear the costume to school since her school had a costume dress up. 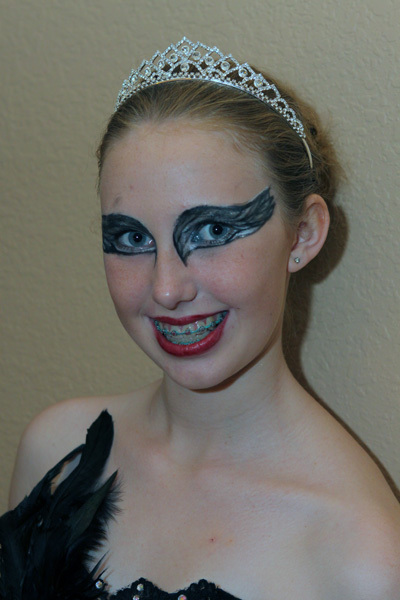 So here is Maddie Halloween night with Black Swan makeup. Wish we would have had the time to make the crown also- but we found a very pretty tiara for her to wear instead. And with her BFF Briannah. They Trick or Treat together every year. And totally make out with the candy. This year 4.5 lbs of it!